Unusual artwork is used effectively in a murder mystery set in a traveling circus. 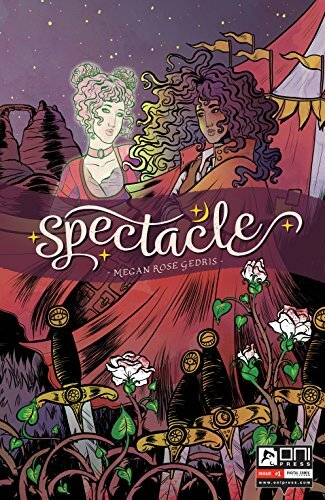 Spectacle Vol 1 is good until the unsatisfactory conclusion. Twins Anna and Kat are members of a traveling circus. Anna is the fortune teller. Kat is a knife thrower. When Kat is murdered with her own knives, she appears as a ghost only to Anna. Anna investigates the crime. The artwork within Spectacle Vol 1 promises to be controversial. It is in the style of Picasso’s blue period but uses mainly dusky reds, lavenders and chartreuse. The faces are almost cubist in their non-linear perspective so noses sometimes appear on the sides of faces. I liked the mystery at the heart of the plot. I would have liked to see more backstories of the other circus performers. Many seemed like only a stereotype like the conjoined twins and the bearded lady. It took me about a third of the book to get used to the art style. Once I did, I enjoyed its uniqueness. Spectacle Vol 1 collects issues #1 through 5. My problem with the collection is the abrupt ending. There is no resolution to the mystery here—only an inexplicable transformation that could mean anything. I actually purchased issue #4 because I thought that the last few pages of my Advanced Review Copy were missing. $1.99 later, I realized that issue #4 ended as suddenly as Vol 1. However, issue #4 included a page imploring the reader to purchase issue #5 in July 2018. While issues frequently employ cliff-hangers, it is rare and frustrating for collected volumes to do so. Because of this slight-of-hand, Spectacle Vol 1 receives 3 stars.